Collectible ACEO Art Up For Grabs!!! Opening bids start at $.01 with FREE shipping on eBay! Shall We Dare to Dive in to the Mysterious World of These Illustrations Then? So, my favorite kind of art to do is ACEO which stands for "Artist Card Editions and Originals." They are 2.5" x 3.5" (which is the same size as baseball cards) and are a way for artists and collectors to connect inexpensively. Price is not the reason I like it though... as a tabletop gamer and simulation lover, I just like all things "miniature." Tiny art has a charm that's irresistable to me. So yes, I draw ACEO's but I also collect them. 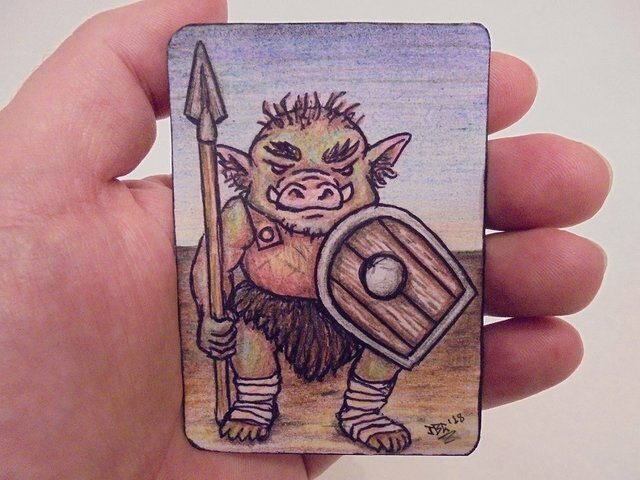 My latest are up for auction on eBay and I decided to share it on Steemit (I have shared previous ACEO art in former posts and will prolly do so again). This orc was an innovation on previous critters of this sort... in that it has "hairy ears." I will admit this wasn't MY idea and someone else insisted I should do it... still creeps me out though, lol. Whudya' think, should orcs have hairy ears? I kept thinking of "Punky Brewster" while drawing this... 80's on the brain syndrome! Also... what do you think of her skull necklace? I think it's super adorbs! I'm an "old school" drow freak... I don't mean the "emo" dark elves from the R.A. Salvatore books, but further back were the fashionable yet insane psycho killer dark elf creations of Gary Gygax. My drow art is inspired by that... and as per 80's fashion... Duran Duran (or was it Adam Ant?) style sashes are not simply optional. This one kinda' reminds me of the villains from Teenage Mutant Ninja Turtles cartoon in the mid 80's... either Beebop or Rocksteady, one of those two... can't remember which one, lol. 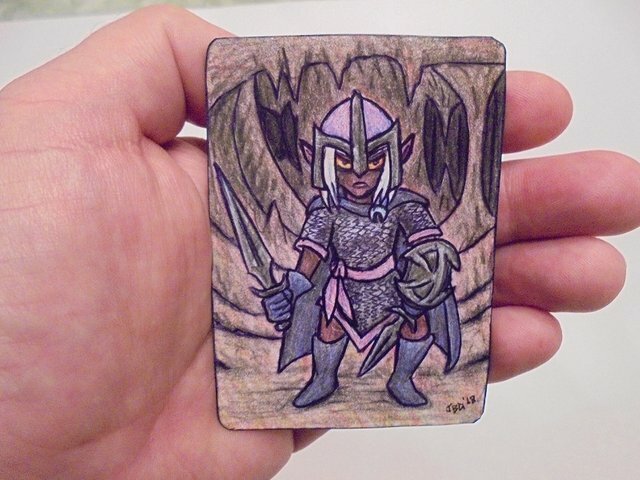 Do You Want to Draw ACEO Cards Too? It's pretty Simple! All you need is some cardstock (or just paper, which you can glue to the back of recycled food box container "card"). Then, you can use anything you like, pencil, pen, colored pencil, crayon, literally anything. Some people will use things like glitter glue and collage pieces as well. You'll probably need scissors to cut the finished piece to the right size (and a playing card can help to trace that out). 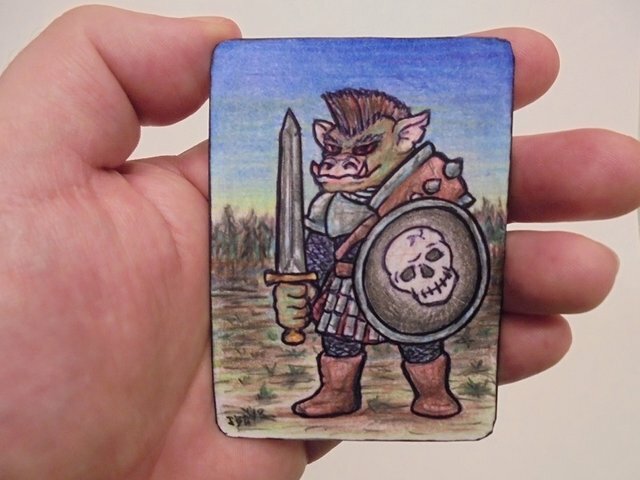 The only rule is it needs to be the size of a collectible card (like a baseball or CCG card) which has the dimensions of 2.5" x 3.5" (anything else isn't ACEO). So far as I know, places where a lot of people sell ACEO's are on Etsy and eBay. People also sell on Facebook "marketplace." What I wish is that people would buy and sell them for crypto... I wouldn't know how to set that up but someone smarter than me might figure that out (or if it's already been figured out, I guess as usual I'm last to know, lol). 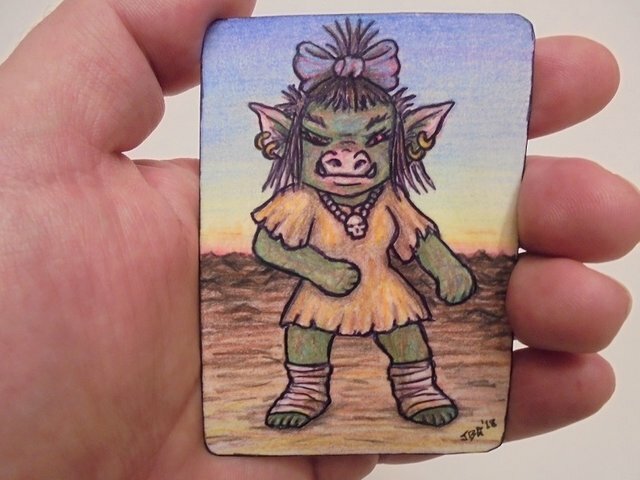 I think it was back in 2011 that ACEOs were a lot more popular as it was a new fad and there were a lot of "clubs" and "meetups" for artists to get together and discuss/trade cards. Probably doesn't happen now... but maybe it could? Post about it on Steemit using the ACEO tag! And thanks for checking these out. If you made a bid, good luck! Also, thanks for upvoting and/or resteeming, you're the best!!! Thanks for the upvote and reply @steemeow ...followed you because ...kittehs!